Confessions of a Dressage Barbie: Eventing Bingo! After Cinna jumped out of her paddock on a weekly basis for several months, I decided she was clearly not meant for straight dressage, but needed to be an eventer! I was a little tired of confining myself to the sandbox anyway, so it was cool. 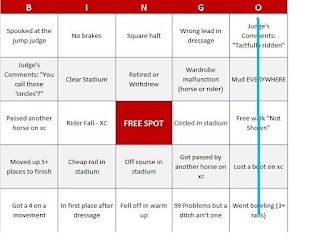 Plus eventers have lots of matchy-matchy tack, and my feelings on that are crystal clear at this point. We signed up for a schooling show a few hours away, and I prepped for months! I called up SprinklerBandits to see if I could borrow her pool boy for a weekend, but she said no. What a dressage queen! Unfortunately, in the weeks leading up to the event, it rained INCESSANTLY! I was worried about cancellation, but not to fret – eventers are made of hardier stuff than that, and the day dawned bright and early! But there was mud EVERYWHERE! Cinna and I headed down centerline hoping to put in a stellar dressage test that would leave our competitors in the dust! 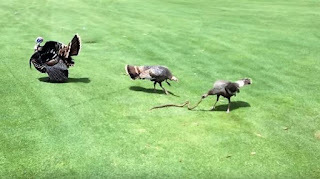 Things were going along just fine until the free walk – a small garden snake was slithering through the dressage court, when a spectator’s emotional support turkey spotted it and raced into the arena in attack mode. Understandably, Cinna vehemently protested this intrusion, and our “free walk” ended up being a diagonal bolt before I finally regained control. The snake and turkey were fighting in the center, but our test had to go on! While we did finish the test, obviously I only had part of Cinna’s attention throughout, and the judge’s comment of “tactfully ridden” was probably just so I didn’t scratch the rest of the day and go home to cry -- although the "free walk not shown" was accurate! Foiled by a turkey. Luckily the other two phases gave us a chance to redeem ourselves! We headed over to the cross country start box (am I using all this terminology right eventers? I’m really trying!) all decked out in our colors of black and teal – I was particularly proud to show off my awesome ME boots! (they’re my favorite). We were off like a shot and started strong, jumping the first three fences without Cinna batting an eyelash! We had just entered the woods when the next problem of the day presented itself – a laser grid across the path. What on earth was it? Aliens? Yes! I spotted their alien spacecraft partially camouflaged by the trees. I growled at Cinna and she gamely ran directly through the alien laser beams, losing one of my precious ME boots in the process. Damn and blast. Stupid aliens. I guess they were so fascinated by the ME ARTi-LAGE technology that they wanted to steal some so they could reverse-engineer it for themselves. Escaping the alien trap unscathed gave Cinna wings, and we went clear in cross country! Despite a dismal start to the day, I still had hopes we could go double clear, as long as she kept her brain in her head for stadium jumping. 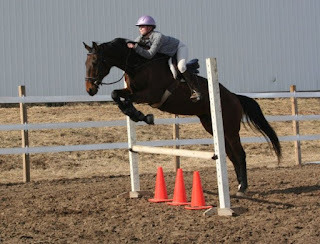 As she cleared the first oxer with ease, I started to grin – maybe we could actually do this! We headed for a tricky vertical off a tight corner, and she sailed over it. There was a colorful Swedish oxer up next, but she didn’t bat an eyelash at the garish color scheme, neatly hopping over it with inches to spare. 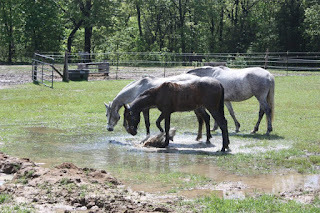 Water isn’t always her favorite, so I held my breath heading to the liverpool, but Cinna had her brave pants on and cleared it easily! We cruised through the course and were almost home free – just a triple combination left and we would be double clear! But then – disaster struck. Are you sensing a theme? I’m sensing a theme. Apparently the universe was uninterested in my and Cinna’s eventing debut. As we headed towards the last few fences between us and our first completed event, a large helicopter made it’s descent to land in the (thankfully empty) dressage court. Cinna was so distracted by the helicopter (I mean, who could blame her?) that she pulled rails in every fence of our final triple combination. I groaned – so close to clear, but three rails down? 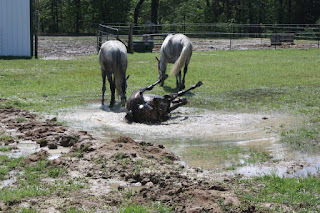 I believe you eventers have a term for that – going bowling. Those are the breaks! As I dejectedly exited the arena, Phillip Dutton exited his private helicopter and walked over to tell me that he came to scout me and Cinna to be his proteges aiming for the 2020 Olympics. Sorry dude – the fates have spoken. Cinna and I are not meant to event – we should stick to the sandbox! Emma, thanks for the multiple fit of giggles I had while writing this -- hopefully everyone else is as entertained! Oh my. That video just made my day! This is freaking hilarious.